Spring is here and with the arrival of warmer weather comes the seasonal abandonment of stodgy comfort food and the search for lighter, fresher dishes. Just in time comes a tantalising new book from writer, food stylist and cook Rosie Birkett. Titled A Lot on her Plate, it is an accumulation of Birkett’s favourite recipes developed over her career so far. An ardent traveller, Birkett embraces vibrant, global flavours but also enjoys putting a fresh spin on the classics. 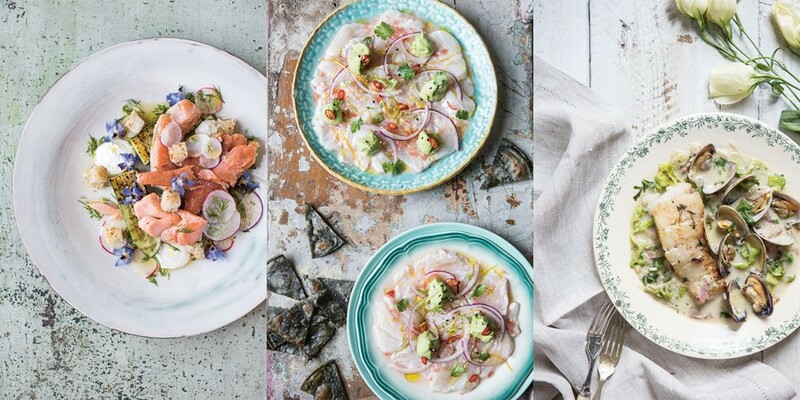 Thus the book's recipes range from Mexican ceviche with avocado cream to asparagus with charred lemon butter and parmesan, and the result is a medley of contemporary, creative dishes for all occasions. Here in celebration of its release, we catch up with Birkett to discover more about her culinary past and her top tips for London dining spots, alongside two of our favourite recipes from the book. Spring traditions: "I grew up in Kent, foraging with my dad long before it was trendy, so in the spring I love to get out into the countryside – or failing that, out into Walthamstow Marshes, and hunt for wild garlic, and the first of the elderflowers. There’s nothing better than free food you’ve found yourself! Other than that, I just get really dweebily excited about all the new produce that comes in, and after months of slow cooking and comforting stews and braises, I get my kicks making loads of delicious salads. 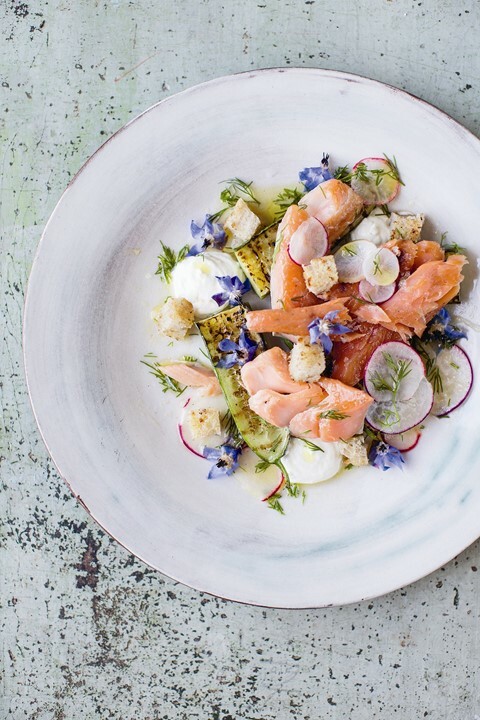 There’s just so much good stuff at this time of year – I can’t get enough of Jersey Royals or asparagus." Her favourite food memories: "Making mushrooms on toast with my dad after getting up at dawn to find them. Hours spent with my mum, dad and sister, picking cockles out of the sand on French camping holidays and later eating them with vinegar and shedloads of white pepper. My mum’s legendary Sunday roasts, which would go on for hours. And sitting in the famous seafood cafe on the edge of Rungis market eating whelks with Pierre Koffmann – a living legend." Ingredients she couldn't live without: "Eggs, flat leaf parsley and Maldon sea salt." Her favourite recipe from the book: "You’re asking me to choose between my children! 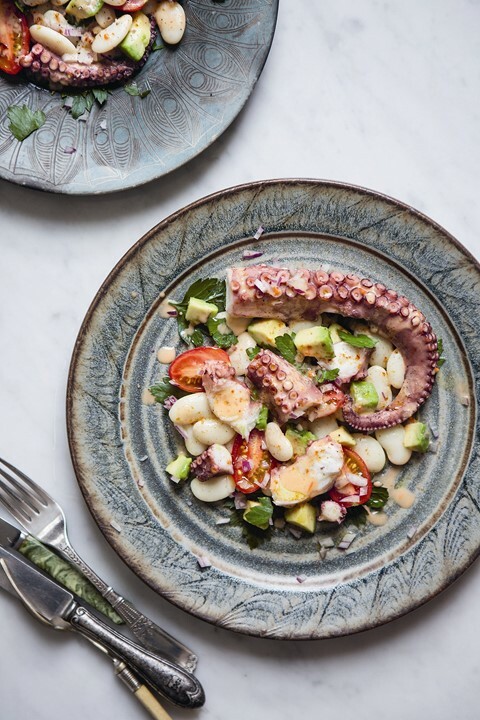 But I’m very proud of the octopus carpaccio, and the salted butterscotch popcorn cheesecake." Her favourite places in London: "Where I live in Walthamstow Marshes is just amazing. We walk five minutes from our flat and we’re surrounded by nature – ducks, geese, horses, elderflower in spring and summer. It’s a crazy urban and rural landscape spliced together. For eating, I adore Lyle’s in Shoreditch, Verden in Clapton, and Carousel in Marylebone for its ever-changing roster of guest chefs." The key tips she's learned from other chefs: "The importance of seasonality – it all starts with the quality of the ingredients. Also that you can make something really delicious out of very little if you know how to cook properly." Though it’s Peruvian in its origins, I really fell in love with ceviche when we were travelling down the coast of Mexico’s Yucatan peninsula. 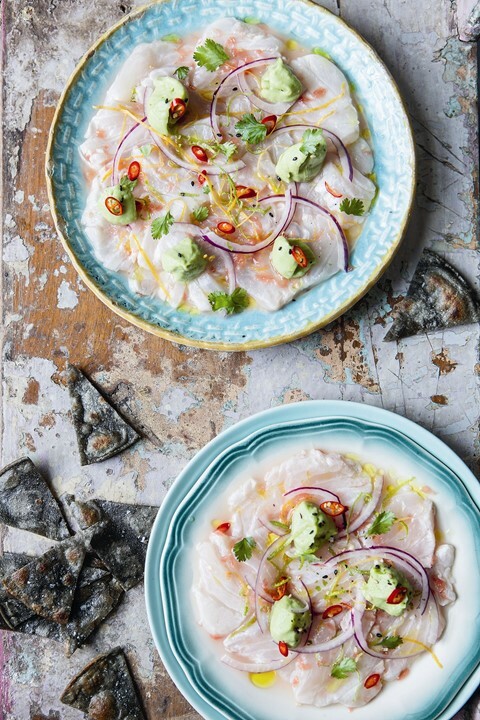 Almost anywhere we ate, we’d order this refreshing, spicy dish of fresh fish ‘cooked’ in a bright citrus marinade and layered up with avocado and red onion – so good eaten with crunchy tortillas and a bit of fiery habanero salsa. This is my version, with the avocado made into a smooth cream which melds with the tangy fish and is just wonderful spread on the crisp tortillas. • Remove any pin bones from your fish fillets, and slice the fillets thinly, across the grain. In a jug, mix together the lime and grapefruit juices and zests, along with the fish sauce, sugar and half the chilli. • Put the fish into the jug and leave for 10–15 minutes, stirring gently once halfway through to evenly coat. • While the fish is marinating, make the avocado cream. Blitz the avocado flesh, shallot, lime juice, chilli flakes and tahini in a food processor and blend until you have a smooth cream. Scrape out of the food processor, and into a bowl, and season to taste. • When the fish is ‘cooked’ on the outside but still slightly raw inside, remove it from the marinade and arrange on serving plates. Pour over a spoonful of the marinade and spoon little dots of the avocado cream onto the fish. Sprinkle over the coriander and sesame seeds, if using, sliced red onion and remaining chilli. Drizzle over a little extra-virgin olive oil and serve with the tortillas. This dish, Scandinavian in tone thanks to the pickles and smoked fish, takes ingredients that you may have lying around – lemon, cucumber and bread – and transforms them into something special, by charring them to add a smoky dimension and intensify their natural flavours. I get my smoked trout from Mike Scott, the chef at Hackney’s wonderful Raw Duck restaurant, who smokes it himself at home, but this would work with any good-quality smoked fish, be it trout, mackerel or hot-smoked salmon. • Dissolve the sugar in the vinegar in a small bowl and quick-pickle the radish slices in the mixture. • Heat a griddle pan over a high heat until it’s stinking hot. Scatter with a pinch of sea salt. Brush the cucumber pieces, cut sides of the lemon and sourdough bread with olive oil and griddle for about 8 minutes, until there are black grill marks on them, turning the bread and cucumber over once. • When the ingredients are grilled, remove from the heat and squeeze the lemon juice into a bowl with the olive oil. Whisk with a fork, add the dill and a pinch of salt, and whisk some more, until well combined. Cut the sourdough into croutons. • Drain the radishes from their pickle liquor and place on kitchen paper to absorb the excess vinegar. Divide the cucumber between two plates and flake over the smoked trout. Top with the radish slices and drizzle over the dill and lemon oil. • Scatter over the sourdough croutons and borage flowers, if using, and finish each serving with a couple of teaspoons of natural yoghurt. A Lot on her Plate is out now, published by Hardie Grant Books.